The Wolverines season comes to an end in the National Semi Final. 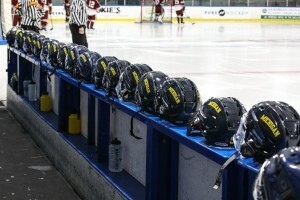 The Michigan Wolverines had their season come to an end in the National Semi Finals on Friday. Michigan entered the National Tournament as the #2 seed in the North and the #5 seed overall in the tournament. Michigan dominated three pool play games, only giving up 1 goal. Michigan beat Nebraska 5-0, Fordham 2-1 and Florida Gulf Coast 6-0 before running into familiar foe Grand Valley State in the Semi Finals. The Wolverines dropped their final contest of the year 4-2 to the Lakers. 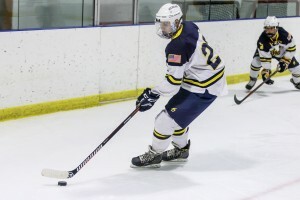 The ACHA will post All-American Awards later this week and The Wolverines are hopeful that they will have a couple players walk away with the honor. The season comes to an end with the Wolverines posting a 30-5-1 record and finishing as the #3 team in the country. The Wolverines received some more hardware ahead of the National Tournament. 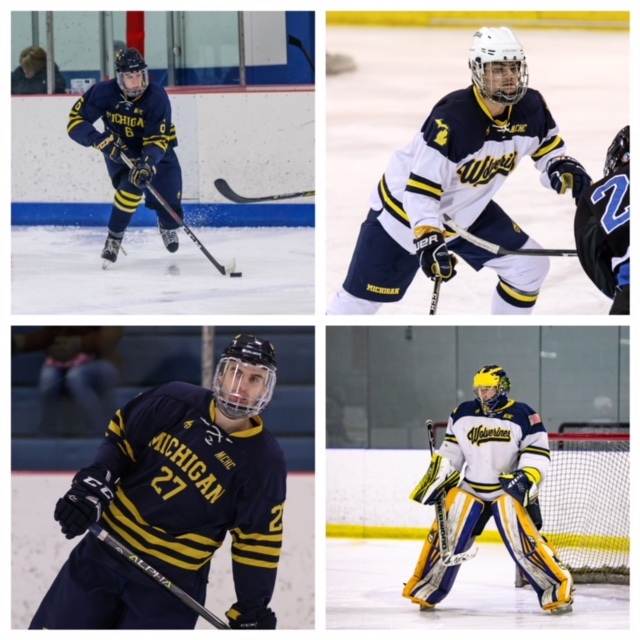 Senior, Goaltender, Evan Chang, Junior, Defenseman, Nick Gawel and Junior, Forward, Aaron Maas received All-North First Team honors. Grad Student, Forward, Cal Stripling received All-North Third Team honors. Head Coach, Jason Bartek was voted as the All-North Region, Coach of The Year, an award that the entire Michigan Staff is worthy of. All awards were voted on by 31 head coaches from the ACHA DIII North Region. The Wolverines begin National Tournament play on Tuesday, March 26th in Dallas, TX when they face off against The University of Nebraska. The Michigan Wolverines enter their last week of preparation before for the National Tournament that begins. The 16 team tournament starts Tuesday, March 26th in Dallas, TX. The team would like to send out a special thanks to Arctic Edge, Canton who went above and beyond this year. The staff at the Edge did a fantastic job giving us a home ice advantage this season and we can’t thank them enough. To all of the people that reached out and donated money, or your time to us, we are greatly appreciative. The support this season has been fantastic and the boys look to cap off the season with a great showing at the National Tournament. Please check back on Tuesday, March 26th for live streaming of our first National Tournament game vs. The University of Nebraska. Grand Rapids, MI, The Wolverines set out for their first MCHC Playoff title. 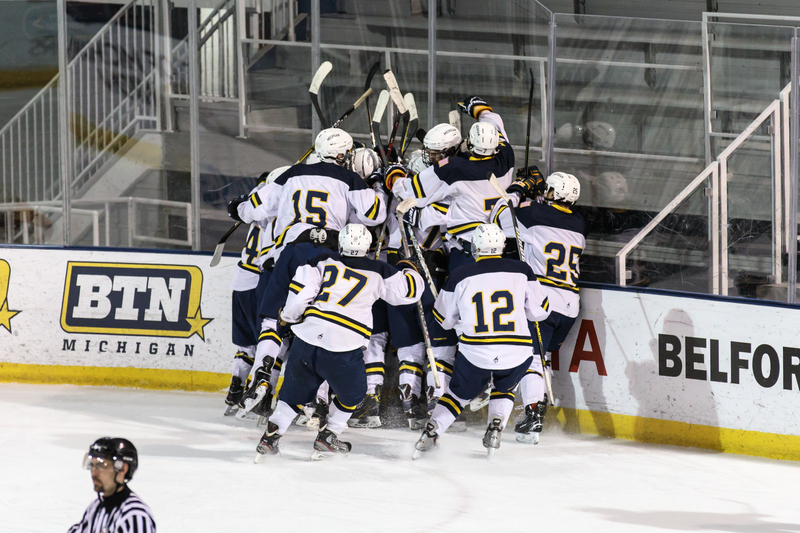 In an emotional effort on Friday night in the Semi-Final, The Wolverines beat Central Michigan 5-4 with under a minute left in the contest. Jr Forwad, Aaron Maas scored his 22nd goal of the season to secure a spot in the MCHC final vs. Hope College. Saturday was a battle with Hope College in the MCHC Championship game. 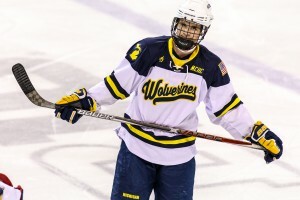 Michigan, missing a few key pieces to their lineup played an inspired hockey game against a very good Hope College Team. The Wolverines scored the first goal of the game, but found themselves chasing the rest of the contest. Jr Forward, Grant Reszcyck scored with under 2 mins left to play to get The Wolverines within one. With :55 secs left to play Hope College secured victory with an empty net goal, winning the game by a final of 5-3. Net up for The Wolverines is the National Tournament in Dallas, TX. The Team will travel to Texas on March 25th for the 16 team National Tournament. Game times will be announced on March 9th. The Wolverines will go into the tournament with a 27-4-1 record and the #2 seed in the North Region. Any and all donations are greatly appreciated!!! As the national tournament approaches, the team is looking to wrap up our fundraising for the the trip to Dallas. Our team is self funded and any donation made is greatly appreciated. We want to thank everyone that came and supported us at games this year along with those who have already donated to our team page. If you have interest in helping the team with a donation to the national tournament, please visit the link below. We hope to see everyone in Dallas. GO BLUE! The Wolverines earn first Auto-Bid to Nationals in program history!!!! For the first time in program history, The Wolverines are headed to the National Tournament. Michigan capped off an incredible regular season last Saturday night when they beat Central Michigan 3-2. improving their overall record to 24-3-1. 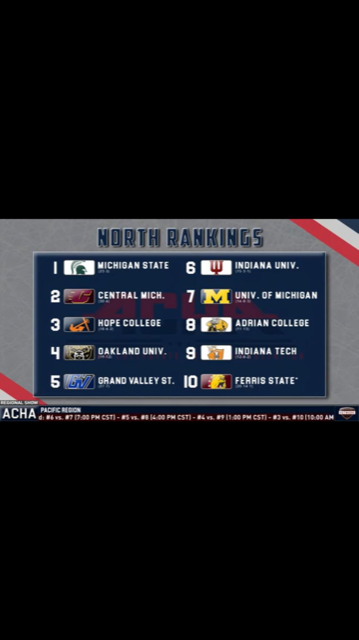 The ACHA announced the final rankings on Thursday and Michigan was awarded the #2 seed in the North, finishing behind only Sault College. 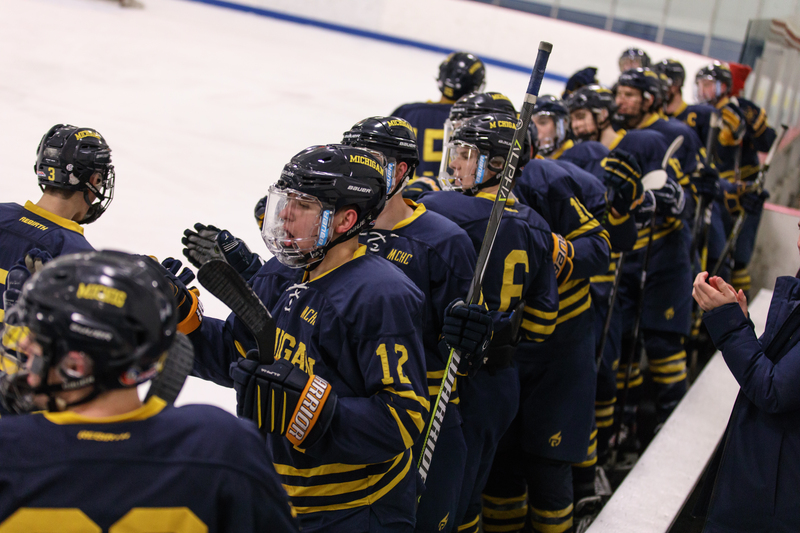 Michigan will play in the MCHC playoffs the next two weekends before heading to Dallas, TX where the National Tournament will be played, March 26th-30th. 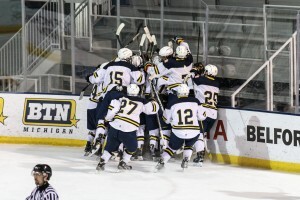 The Wolverines finished off the regular season with 3-2 win over Central Michigan. 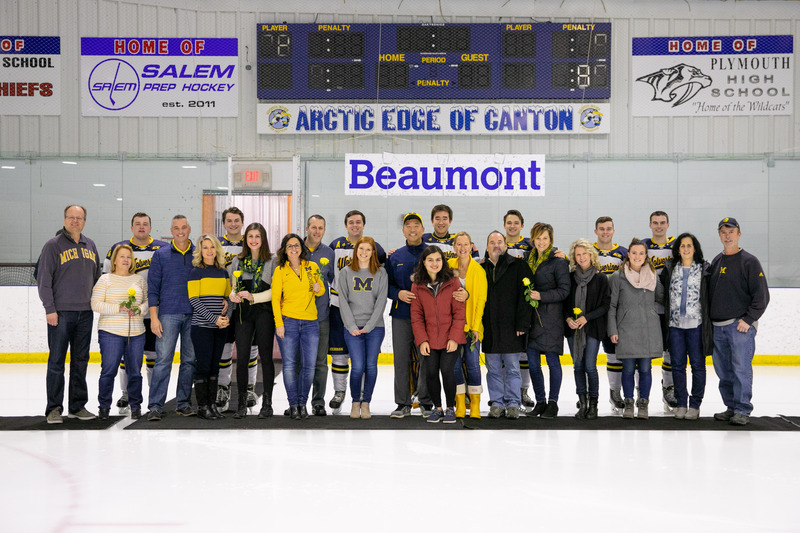 On a night where the Seniors and their families were honored prior to puck drop, The Wolverines came out and took care of business lead by Senior Forward, Cal Stripling and Senior Goalie, Evan Chang. Stripling finished the game with a goal and two assists. Chang stopped 29 of 31 shots and earned his 12th victory of the season. 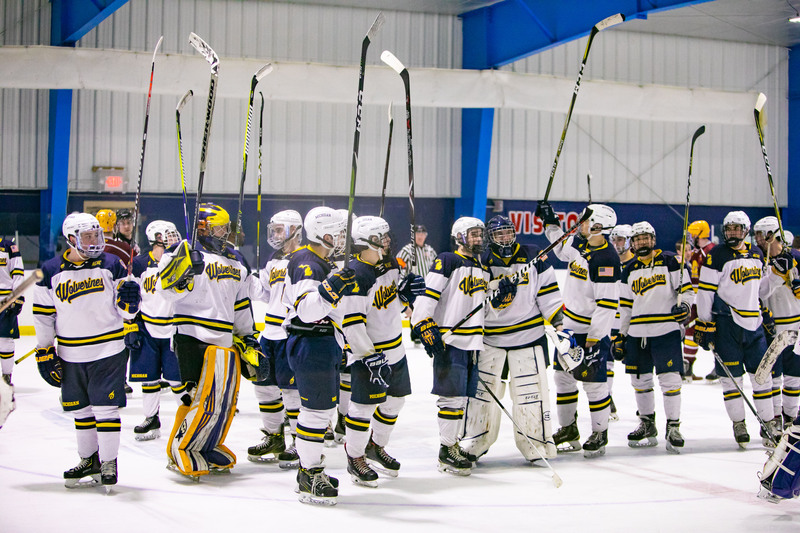 Michigan will host the first two rounds of the MCHC East Playoffs next weekend at Canton, Arctic Edge. Saturday, February 16th @ 8pm, SENIOR NIGHT!!! The Wolverines will finish the regular season this weekend with a series vs. Central Michigan University. Saturday at Arctic Edge Canton is the Senior night for Michigan. Warmups are at 8pm. Come out to the game and help celebrate our seven Seniors as the team looks to wrap up an an incredible season. The Team will be honoring Seniors, Evan Chang, Alex Trouba, Jake Howard, Tim Wilson, Cal Stripling, Michael Ficaro and Erik Anton. 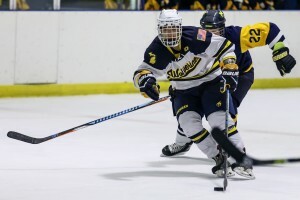 The Maize and Blue tie and beat Oakland to win MCHC East Regular Season crown. 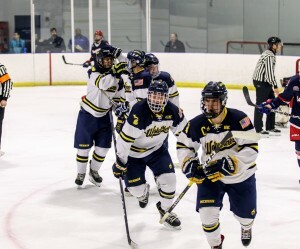 The Wolverines earn their 23rd victory of the year over Oakland University this weekend to win the MCHC East and earn #1 seed for league playoffs. Michigan is still without leading scorer, Aaron Maas, Jr. Forward Adam Jeannotte and Defenseman, Jake Stewart, but the Wolverines were able to battle through and earn 3 points this weekend. Friday night Michigan played to a 1-1 tie at OU. Michigan lead the entire game until a late penalty (later explained as an incorrect) allowed OU to tie the game with just 3 minutes left in regulation. After a 5 minute OT period The Wolverines and Grizzlies remained tied at 1-1. On Saturday Michigan hosted The Grizzlies at Canton where they once again controlled the game from start to finish. After being up 3-0, Michigan gave up a 6-5 goal with 2 minutes remaining in the game. The Wolverines out shot Oakland 104-53 on the weekend. The Wolverines will end the regular season next weekend with a series vs. Central Michigan University. 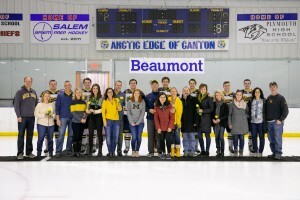 Saturday is Senior Night at Arctic Edge, Canton. Please come out and support our Seniors in their last Regular Season home game. The Wolverines continue with their winning ways. Add two more to the win column. The boys in Maize and Blue sweep Saginaw Valley State 6-1 and 9-3. The Wolverines started slow both nights this weekend, but quickly woke up between the first and second periods both Friday and Saturday night. Grad, Forward, Cal Stripling lead the way with 6 points on the weekend. Evan Chang grabbed is 11th win of the season on Friday, he is now 11-0 with a .940 save percentage. Michigan has four games remaining in the regular season. 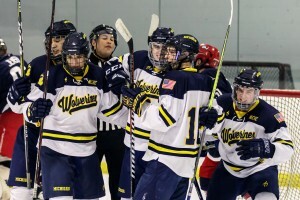 Currently the Wolverines are 10-0 in the MCHC East, three points away from wrapping up first overall in the division. Michigan will head to Oakland University on Friday, 2/8/19 for an MCHC match-up with the Grizzlies, puck drop is 7:45pm. 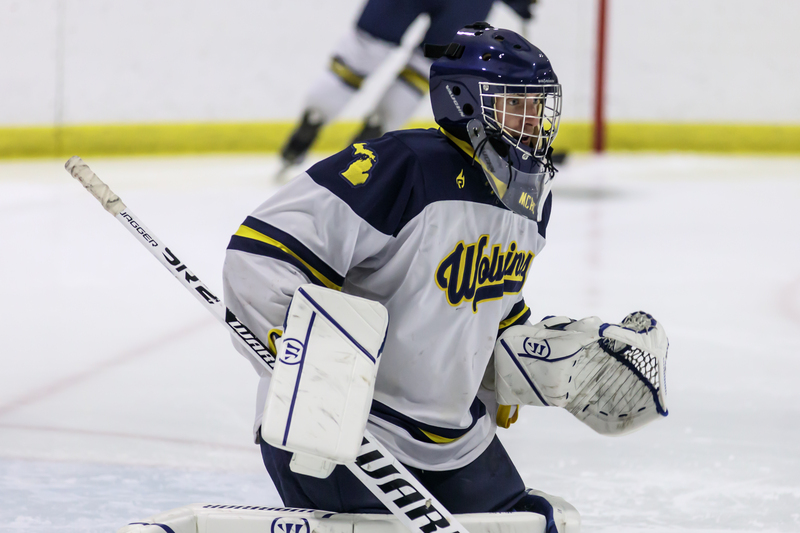 Stripling and the Wolverines set for MCHC match-up with SVSU. Michigan will play a weekend series with Saginaw Valley State this weekend. The Wolverines will host The Cardinals on Friday at 8pm @ Canton Arctic Edge. The Wolverines enter the game 8-0-0 in the MCHC East and 20-2-0 overall. The Cardinals come into the contest 7-3-2 in the MCHC East and 11-11-3 overall. Michigan will travel to Saginaw on Saturday for a 9pm start at The Saginaw Bay Ice Arena. A big 4 points is at stake this weekend, The Wolverines have 6 remaining regular season games including the two this weekend with SVSU. We hope to see you at the rink on Friday. Go Blue! The boys in blue bounced back from their loss to GVSU by sweeping Miami Ohio, 5-1 and 7-1. The Wolverines dominated play in both games out shooting the Redhawks 96 to 31 over the weekend. 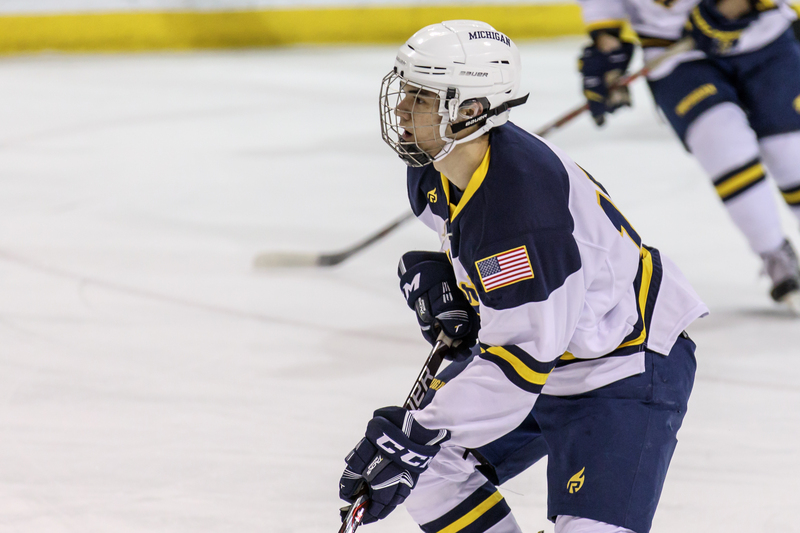 Junior Forward, Grant Reszczyk had 5 goals on the weekend including a hat trick in the game on Saturday. The Wolverines are now 20-2-0 on the season and look to Saginaw Valley State as they will play a weekend series with them on February 1st and 2nd. Wolverines drop game to GVSU for their second loss of the season. 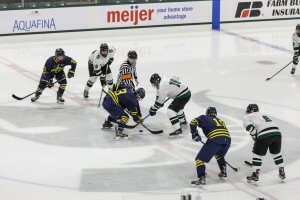 Michigan hosted Grand Valley State, Saturday at Arctic Edge in Canton, MI. The Wolverines got outplayed by the Lakers while being the recipient of some bad luck as well. The Lakers scored with less than two minutes to go on an empty net to put away the Wolverines 5-2. The Wolverines get back to action on 01/18/19 at Arctic Edge in Canton when they host The University of Miami Ohio. Warmups are set for 8pm. The Wolverines finished the semester by beating #4 Grand Valley 6-1 on Friday and followed up by topping #5 Adrian College 1-0 on Sunday. Michigan put together it’s best semester in program history winning 18 of 19 games. Currently the Wolverines hold the number 1 spot in the North Region as well as the #1 overall spot in the country. The boys will get back to action on January 12th when we host Grand Valley for the 2nd game of the season series. Thank you all that supported in 2018, we are looking forward to a big 2019! Happy Holiday’s!!!! The Wolverines go 3-0 on the weekend and earn 6 more points in the MCHC. The Wolverines out score Northwood and Lawrence Tech 33-7 over a three game weekend pushing their overall record to 16-1 this season. The Wolverines were lead by Aaron Maas who had 8 goals and 6 assists on the weekend. 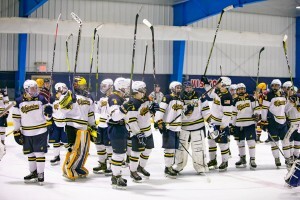 Michigan is currently undefeated in the MCHC pushing their record to 7-0 on the season. The Wolverines currently sit at the #1 spot in the North Rankings. The boys will face off against #4 Grand Valley State next Saturday and #5 Adrian College on Sunday to close out the first semester. 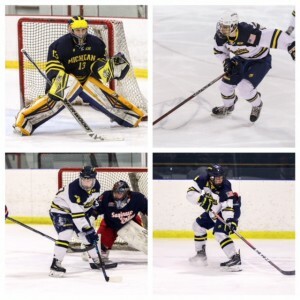 The Wolverines are set for three game weekend with Northwood and Lawrence Tech. The Wolverines will play three games this weekend. It begins on Friday night as we will play host to Northwood University at 8:30pm. 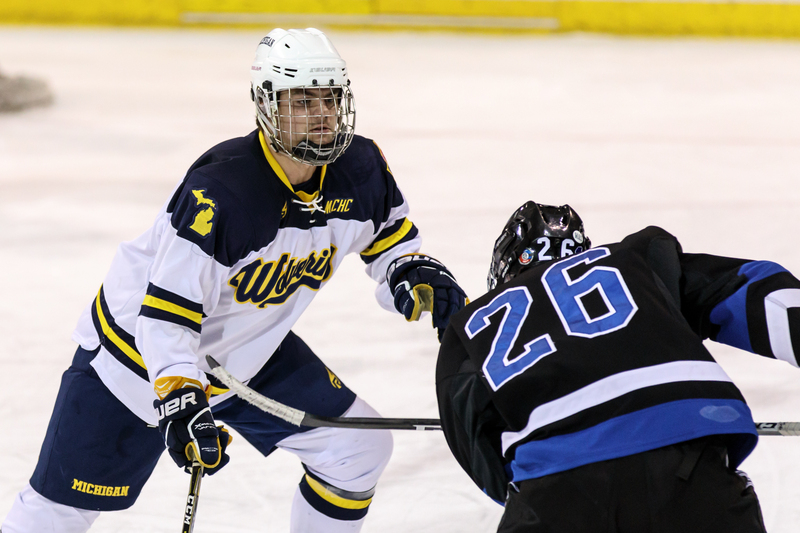 The MCHC east series will conclude on Saturday as the Wolverines will travel to midland. We are back at home on Sunday to play Lawrence Tech for the second time this season and wrap up the home and away series with the Blue Devils. 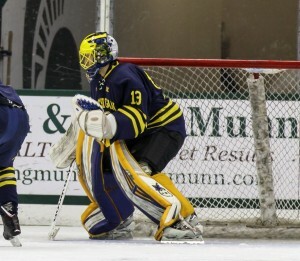 Michigan enters the weekend 13-1 overall and 4-0 in the MCHC East. All three games this weekend are MCHC East contests. 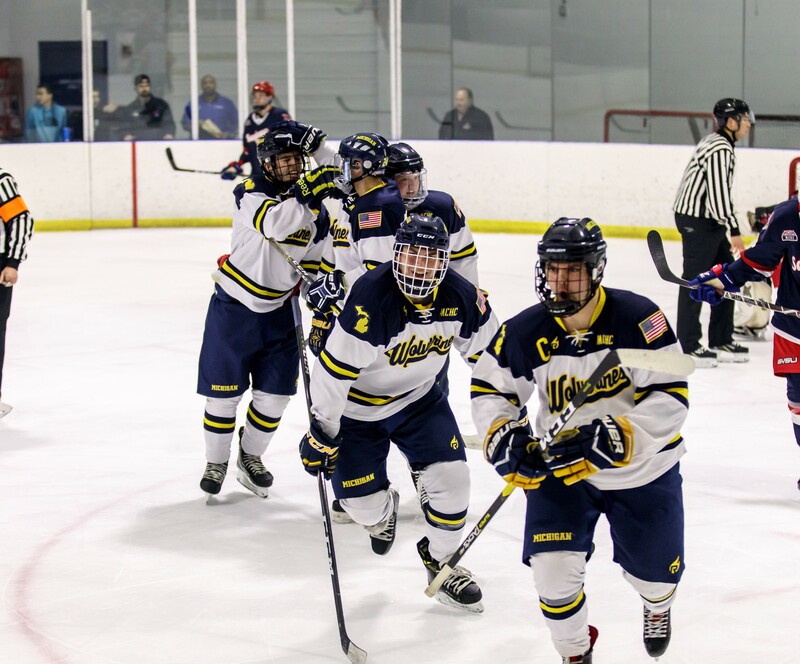 The Wolverines have five remaining games this semester as they look to remain #1 in the ACHA Rankings. 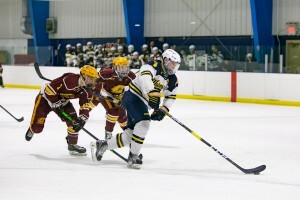 Michigan tops Lawrence Tech and Ferris State on the road. The Wolverines traveled to Lawrence Tech on Friday for an MCHC East matchup. Michigan held the Blue Devils to just 12 shots on net beating them by a final of 6-1. Sunday afternoon the Wolverines traveled to Ferris State to play the Bulldogs in their only matchup of the season. A much different game than Friday, FSU and Michigan exchanged chances, but the Wolverines were able to seal the deal with a Power Play goal by Freshman, Logan Gare. The Wolverines go into Thanksgiving break 13-1 overall and #1 in the North Division Rankings. Michigan has five games remaining this semester, we will host Northwood on 11/30/18 and Lawrence Tech on 12/02/18. We hope to see you there. The Wolverines remain #1 in North Region for the 2nd week in a row. The Wolverines remain number 1 in the weekly rankings after splitting with MSU last weekend. The Wolverines have started the season 11-1-0, dropping their first game of the season to rival Michigan State last weekend. The Wolverines are currently 3-0 in the MCHC which is represented very well in the weekly rankings with 7 teams in the top 10. 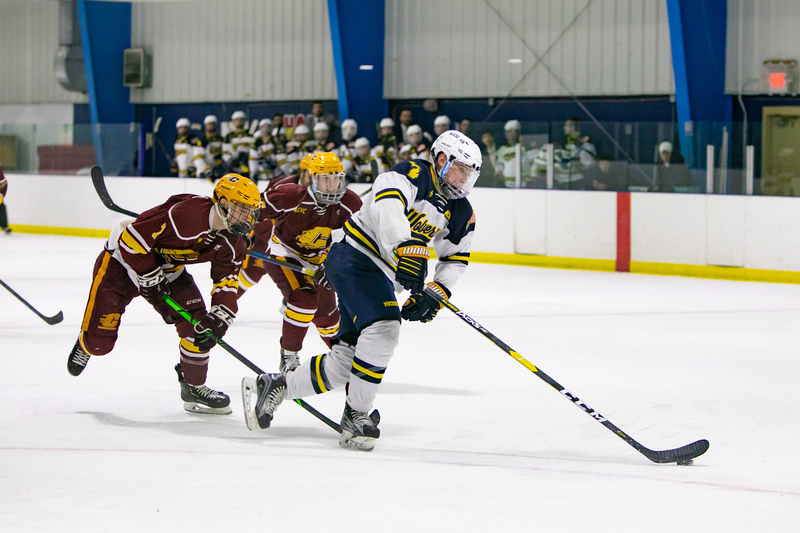 Michigan looks to continue their winning way this weekend when they face off vs. Lawrence Tech on Friday and Ferris State on Sunday. Please check our social Media outlets for live streaming this weekend. Rivalry weekend is here. The Wolverines will battle The Spartans Friday and Saturday. A series that always lives up to the hype, Michigan will face off vs. in state rival, Michigan State. 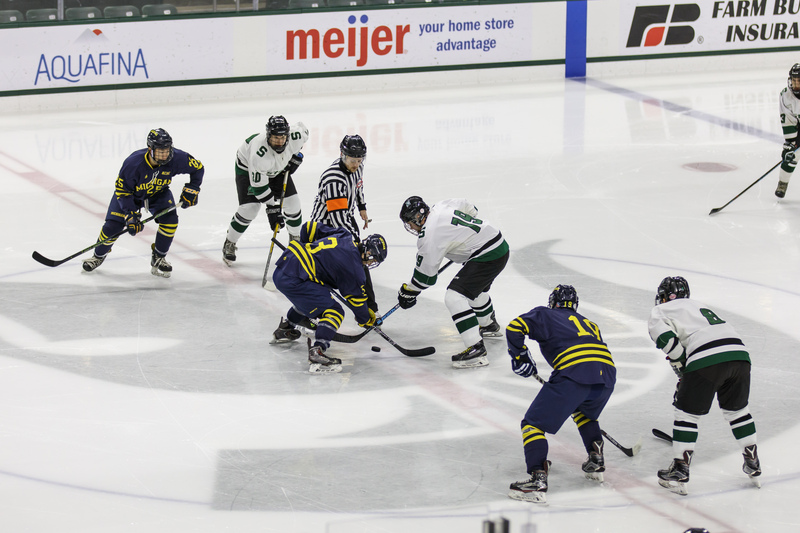 The Wolverines look to continue their unbeaten streak as they take on the Spartans, Friday night at 7pm at Munn Ice Arena in East Lansing. The series will conclude on Saturday at 8pm at Canton Arctic Edge. Both games will be streamed live, we hope to see you on Saturday night. Justin Flanagan earns first shut-out of the year and the Wolverines roll through Milwaukee. Behind the effort of Sophomore goaltender, Justin Flanagan, Michigan won 4-0 Saturday to capture the teams first shut-out of the season. 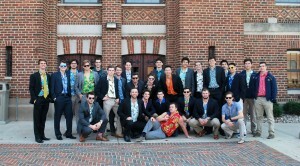 The Wolverines traveled to Milwaukee to play The University of Wisconsin-Milwaukee in a two game set this past weekend. 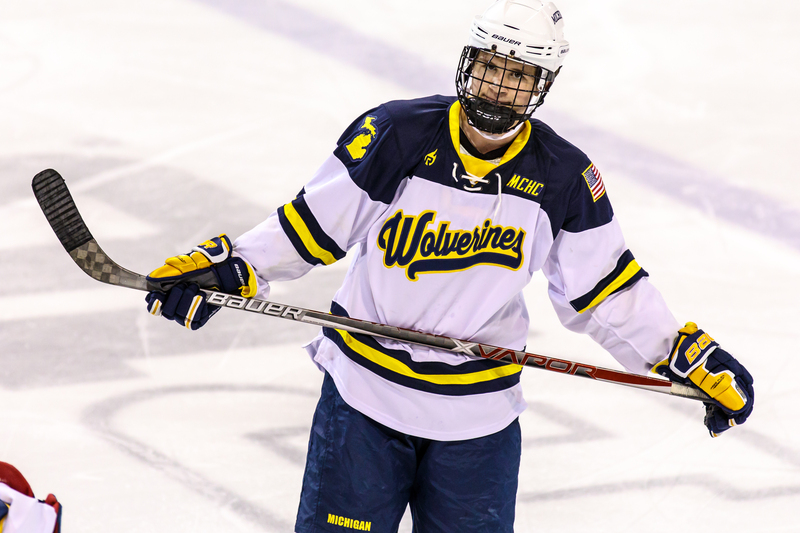 The Wolverines came out sluggish Saturday, but were able to grind out a 4-0 win. Sunday proved to be a much better effort for the Wolverines as they out-shot Wisco-Milwakuee 50-22 and taking game two by a final of 8-1. The Wolverines remain unbeaten this season and carry a record of 10-0 going into rivalry weekend with The Spartans of Michigan State. This weekend we travel to Milwaukee to play Wisconsin-Milwaukee in a two game set. The Wolverines look to remain unbeaten this season as they take on a top 5 team from the Pacific Region. Please check our social media sites for our games as they will be live streamed both Saturday and Sunday. The first game this weekend will take place on Saturday, 11/03 at 7:40pm (CST) 8:40pm (EST) at The Ponds in Brookfield, WI. The Wolverines Sweep UofM-Flint to continue winning streak. 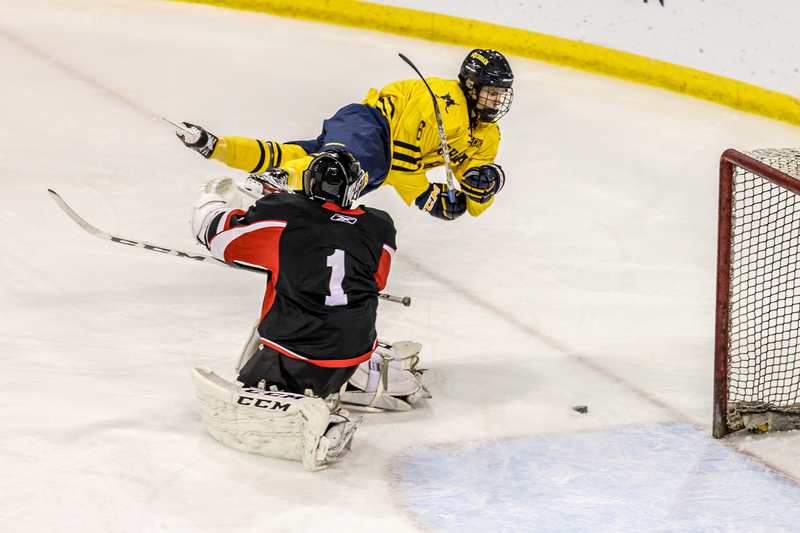 Michigan played a weekend series against familiar foe, Michigan-Flint. 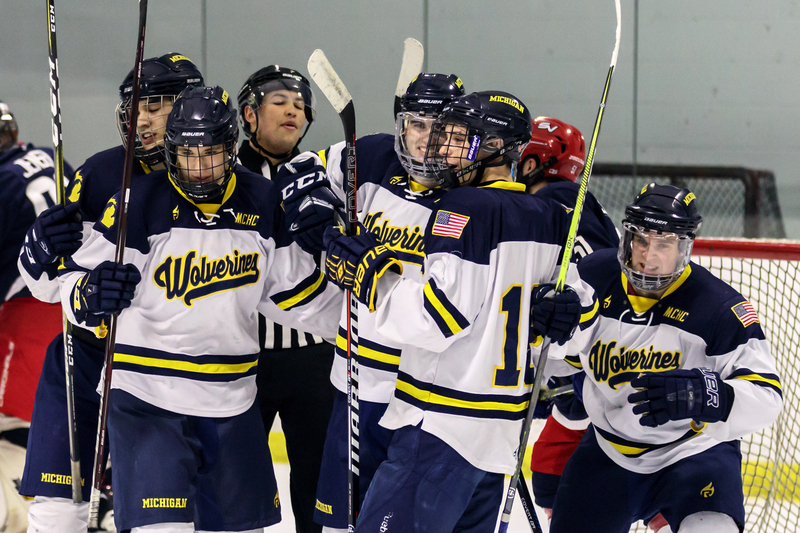 The Wolverines took all four MCHC points, beating Flint 7-1 and 5-3. The weekend was highlighted by Junior, Tim Hasselbach who scored against his old team as well as Junior, Drew Casey who had 5 goals in the two games. Michigan will travel to Milwaukee 11/03-11/04 to play Milwaukee-Wisconsin. Please check our facebook page, or twitter for the live streaming of our games. Michigan tops Adrian College 3-1 to remain unbeaten. Michigan will host Michigan-Flint Friday 10/26pm before traveling to Burton, MI to finish the series with Flint on Saturday. To watch all Wolverine games live, please check facebook and twitter on game days, we will post a new link, weekly. Thank you for your continued support. Behind the effort of Senior goaltender, Evan Chang, The Wolverines were able to sweep Hope College to remain unbeaten so far this season. Michigan took the early lead on Friday night and never looked back. Seven different Wolverines scored in route to an 8-2 win. Saturday night Hope College jumped out to an early lead. The Wolverines continued to battle while being down 3-0 half way through the game. The boys found a way to rally and score six unanswered goals to go onto a 6-3 Victory, sweeping Hope for the first time in program history. The Wolverines will host Adrian College on Friday 10/19 @ 8:30pm. Michigan sweeps Notre Dame to go 3-0 in their first week of play! The Wolverines went into South Bend this weekend and swept Notre Dame. Michigan beat the Fighting Irish 7-2 on Friday and 6-2 on Saturday. Freshman Logan Gare got it started Friday night scoring his first three goals as a Wolverine. 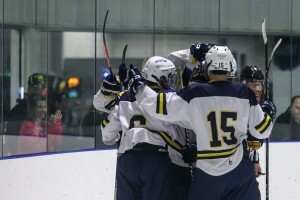 Michigan battled both nights going into tight games entering the third period, but the team kept grinding and found a way to take control in the third period, scoring 5 goals Friday night and 4 goals Saturday. Michigan travels to Holland, MI next Friday to play defending National Champion, Hope College. The Wolverines will close the weekend series on Saturday at Canton Arctic Edge, we hope to see you there. Wolverines open up 2018-19 season with 15-1 win over WCC. 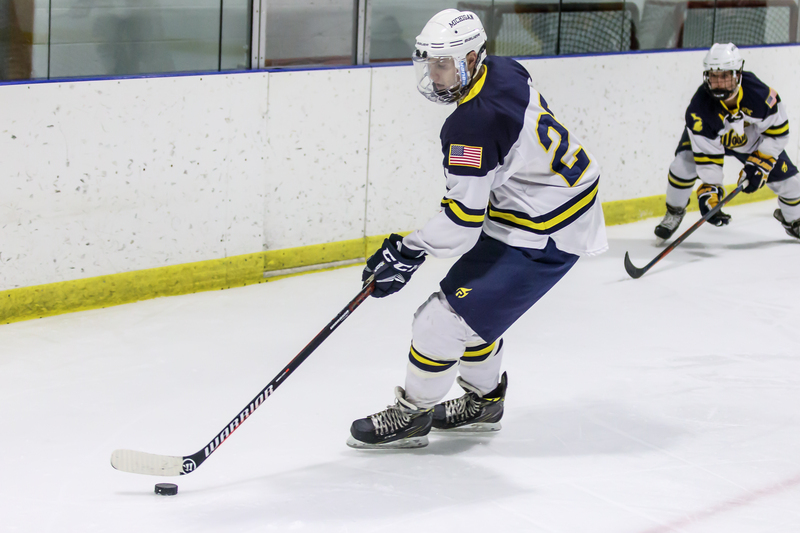 Michigan opened up the 2018-19 campaign with a 15-1 win over Washtenaw Community College. The Wolverines had 11 different goal scorers. Newcomer Grant Reszczyk and Guyot Lapointe both had hat tricks. Noah Helber and “BIG” Al Iafrate netted their first goals with the Wolverines. Freshman goalie, Ben Heilman earned his first win and made 18 saves. The Wolverines travel to South Bend Friday to play Notre Dame this weekend. Wolverines proud to send Calso, Gawel and Maas to Russia with the ACHA Selects Team!!! For the first time at the ACHA level, The Wolverines will be represented at the Student Hockey Challenge in Krasnoyarsk, Russia. John Calso, Aaron Maas and Nick Gawel were selected to be part of the 22 man roster that will compete in Russia over the next 8 days. The tournament will host several University teams from Europe and Russia along with the ACHA Selects Team which is made up of student-athletes across the United States. The three Wolverines fly out to New York today for a pre-tournament game against NYU before leaving for Russia tomorrow morning. 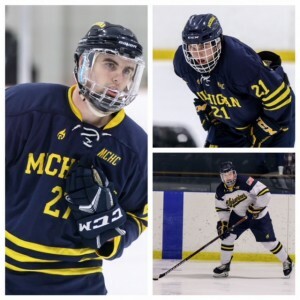 Best of luck to the three of you as you represent The University of Michigan and the United States! 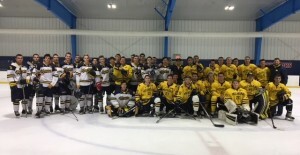 2018 Wolverines defeat Alumni 9-4 in first annual Alumni Game!!! Friday night the 2018-19 Wolverines welcomed back several alumni for our first annual alumni game. The alumni were able to keep the game respectable, but the 2018 Wolverines showed to be too much taking down the alumni 9-4. The Wolverines are in their last week of preparation before taking on WCC, Wednesday, October 3rd at Canton Arctic Edge before traveling to South Bend, IN for a two game set with the Fighting Irish. We would like to thank all of our alumni for coming back and taking part in the game this Friday. 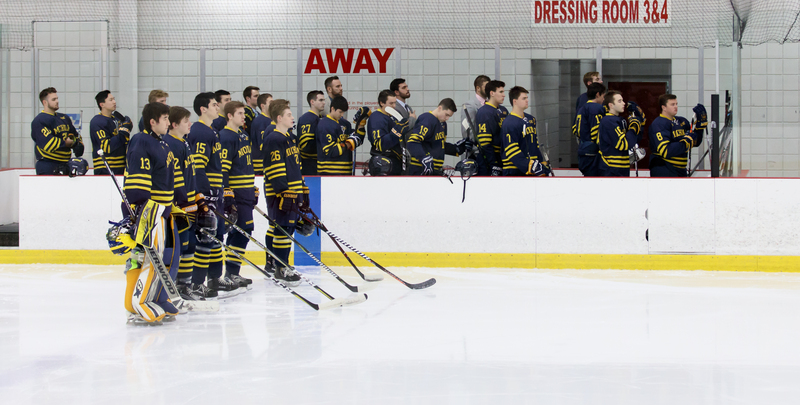 The 2018-19 Wolverines are looking forward to a very competitive season and we thank you all for your continued support. 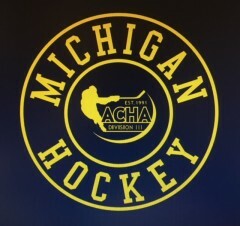 The Men’s ACHA DIII Hockey is part of the MCHC Conference and plays 30+ games per season. We are looking to add players that can commit to our program and make hockey a priority while excelling in school.